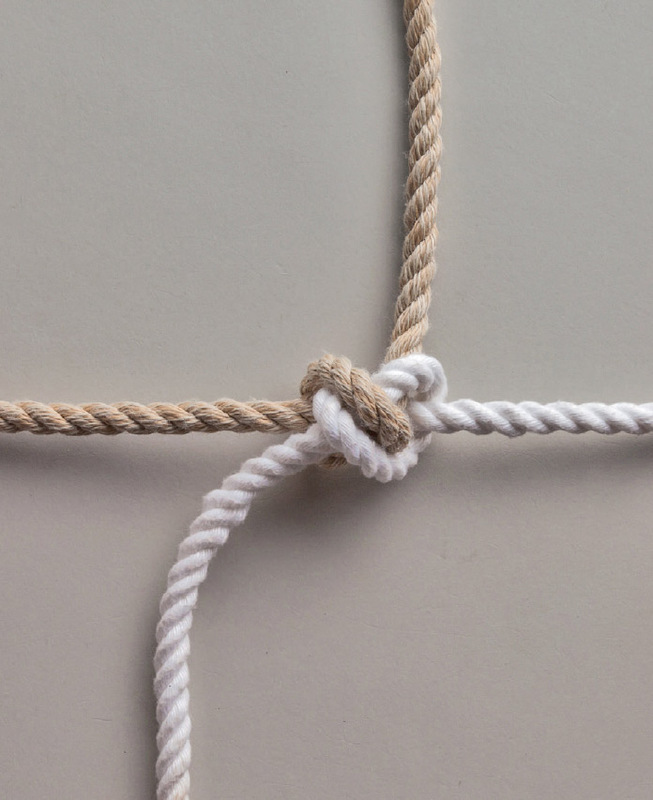 Bends are used to tie the ends of two—or occasionally three—ropes together. 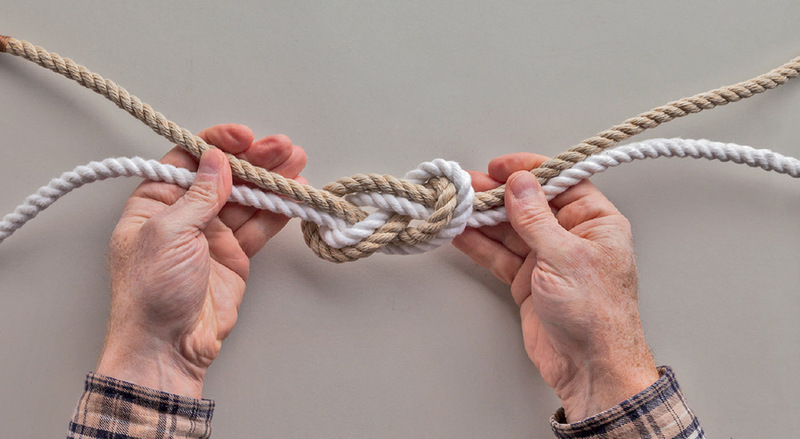 In accomplishing this, a bend is generally an easier, quicker, and less bulky solution than tying two loop knots through one another. 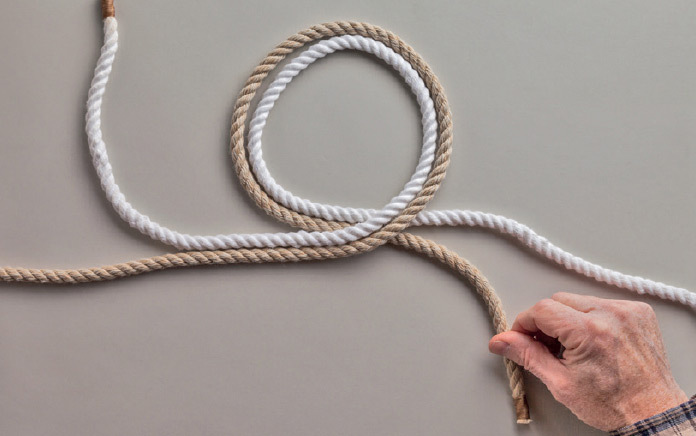 Some bends work best with ropes of similar diameter, while others are optimized for ropes of different sizes, and some work well in flat materials such as leather straps or nylon webbing. near the working end of one strap or rope. Working from the opposite direction, thread the other line’s working end through the Overhand Knot, parallel to the first working end. 2. 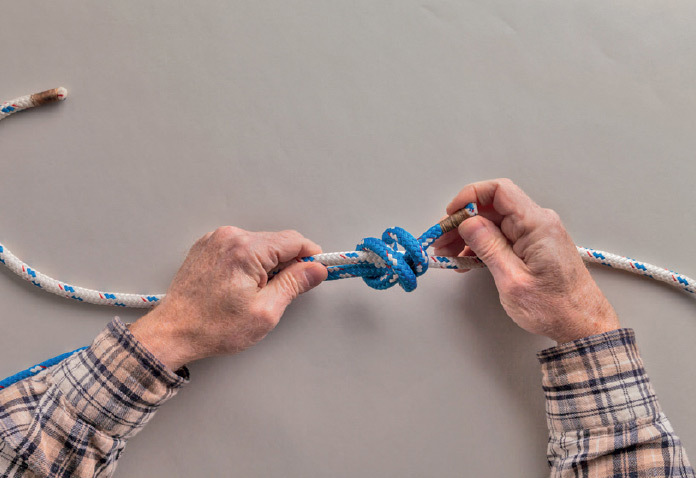 Continue threading the second working end parallel to and around the first Overhand Knot so that it forms its own Overhand Knot. 3. Pull the working ends to remove slack, then pull the standing parts to tighten. 4. 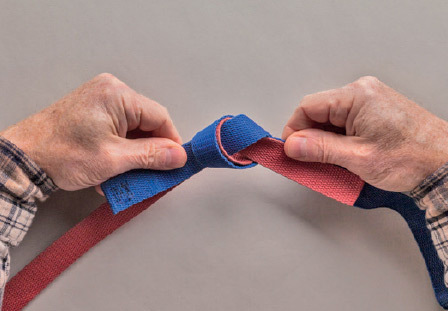 When tying in straps or webbing, keep the two lines flat, untwisted, and parallel to one another all the way through the knot. 5. 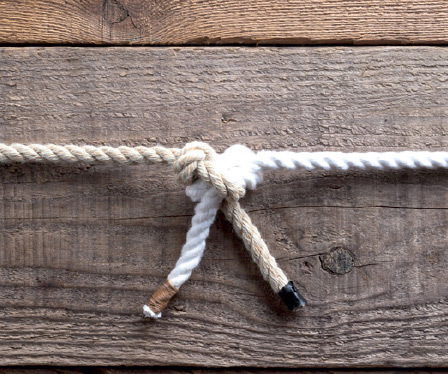 To keep flat materials from bunching up, the knot must be tightened gradually and continually faired. 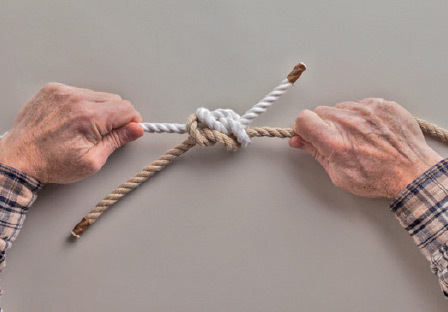 Untying: Pry the two crossing turns away from each other, then pull the working ends through the crossing turns. 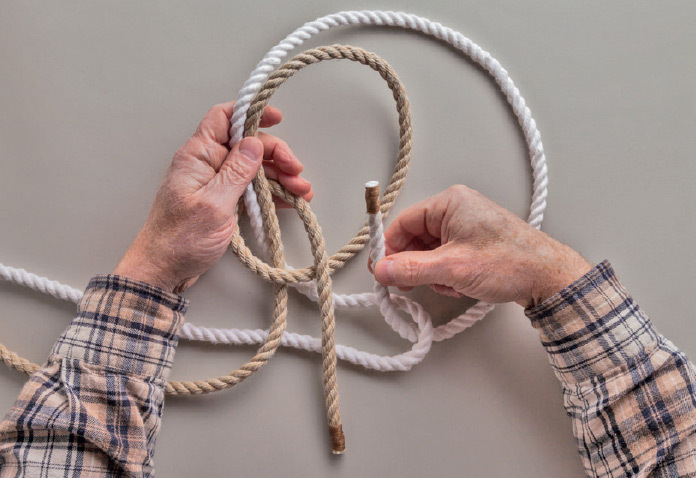 uses a to reverse the direction of the working end of the thinner rope, so that it faces the same way as the working end of the larger rope. 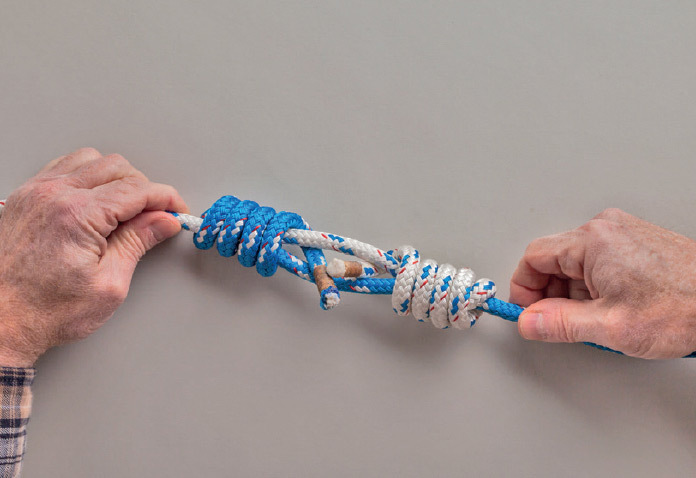 With both working ends facing away from the direction of movement, the knot is less likely to catch on an obstruction if the line is dragged along the ground, and it will create less drag if towed through the water behind a boat. 1. 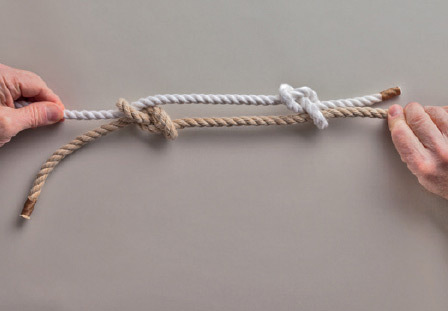 Tie a standard Sheet Bend. 2. 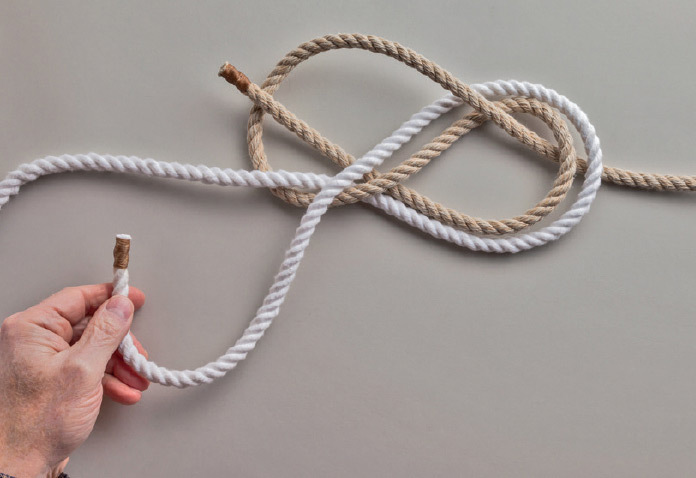 Bring the working end of the thinner rope back around its own standing part. 3. Tuck the working end through the crossing turn at the end of the thinner rope from back to front. 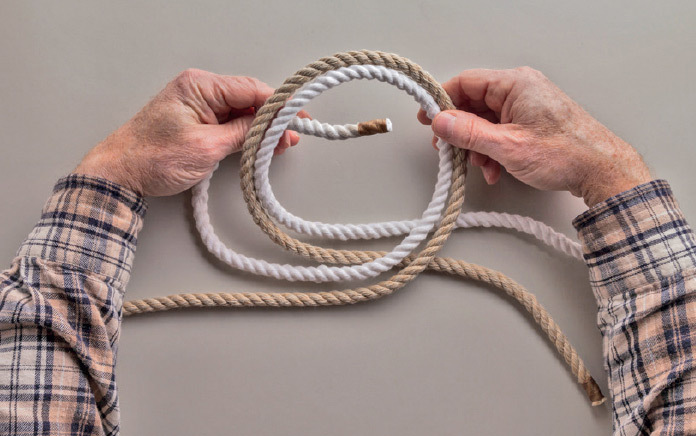 This completes a Figure 8 Knot in the thinner rope. 4. 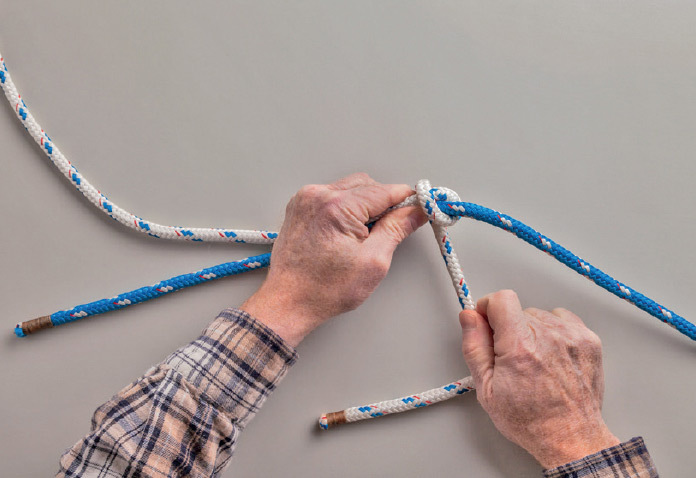 Hold both parts of the bight in the thicker rope together with the working end of the thinner rope. 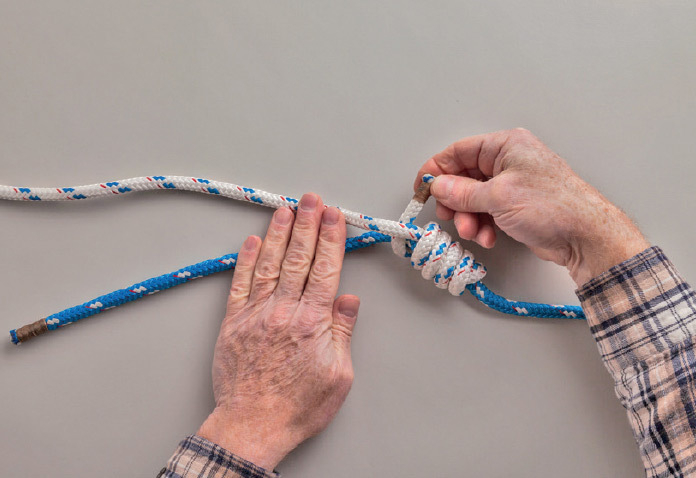 Pull the standing part of the thinner rope to tighten. 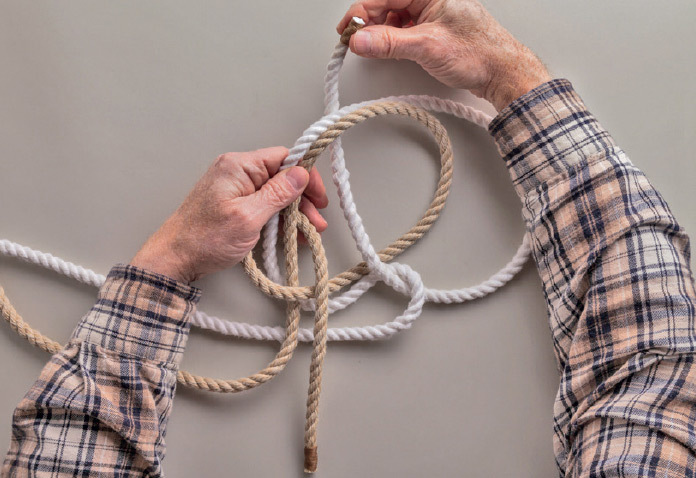 Untying: Pull the working end of the thinner line out of the two crossing turns in sequence to undo the Figure 8 Knot.
) tied in ropes of equal diameter. 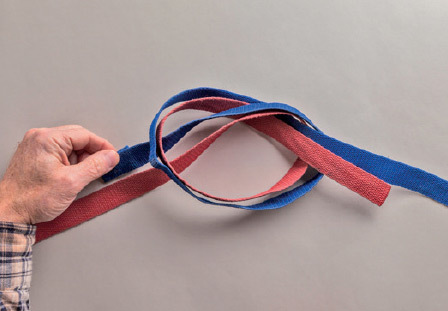 It’s difficult to untie in natural fiber, but easy enough in slipperier synthetic. 1. 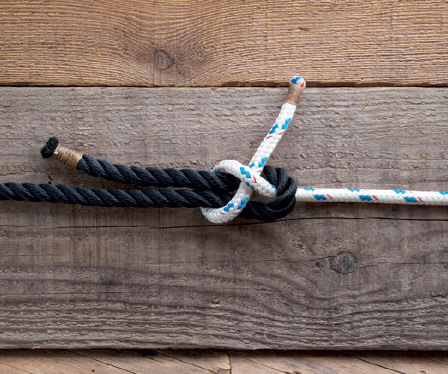 Tie a Figure 8 Knot in the end of one of the ropes. 2. 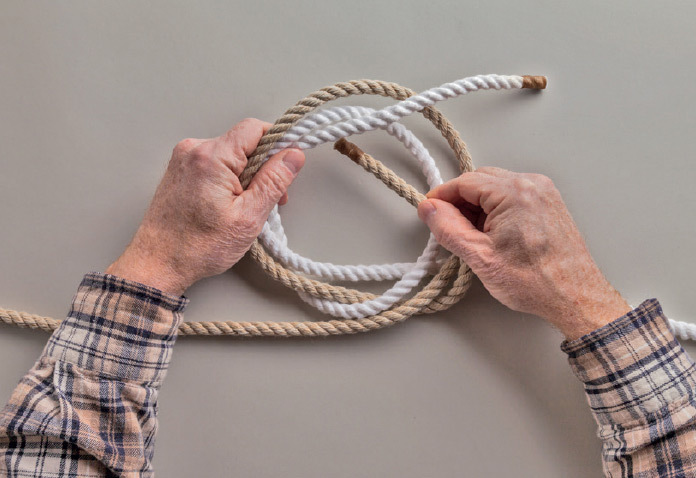 Pull a long working end of the other rope through the first crossing turn of the first Figure 8, parallel to the first one’s working end but from the opposite direction. 3. Use the second working end to follow the first figure 8 around in parallel. Go over the first rope’s standing part and follow its second crossing turn, going next through its first crossing turn from back to front. 4. Keep following the first figure 8 with the second working end. The last move takes it back through the second crossing turn of the first rope from front to back. 5. 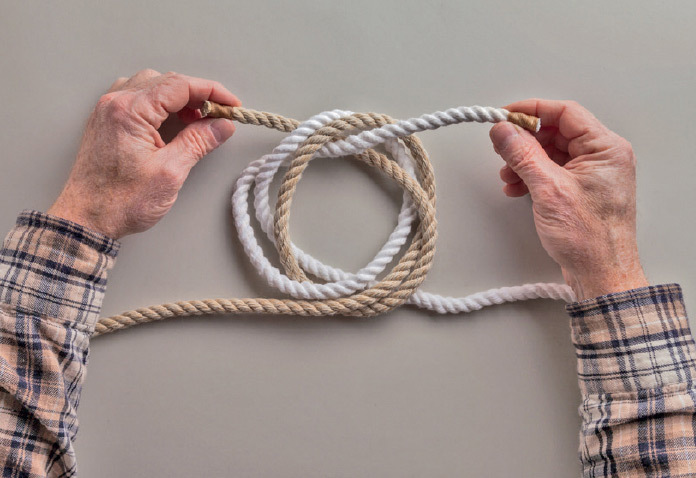 The threaded nature of the knot is apparent before tightening. Both lines run parallel throughout. 6. 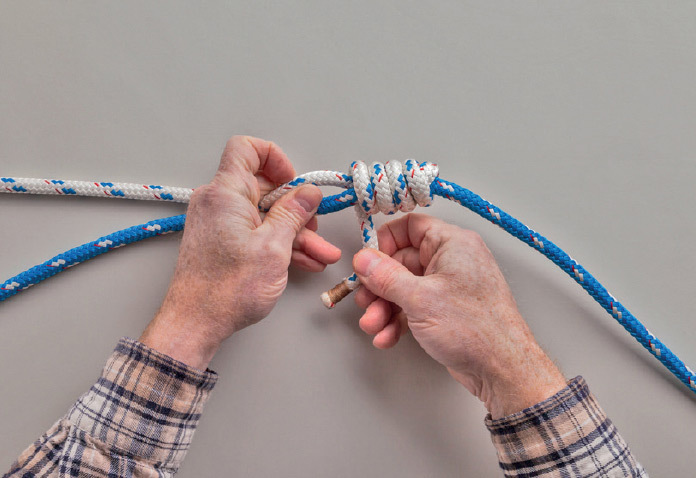 Tightening requires holding one standing part and pulling alternately on the two strands on the opposite end of the knot, then switching to hold the other standing part and pulling alternately “new” opposite ends. 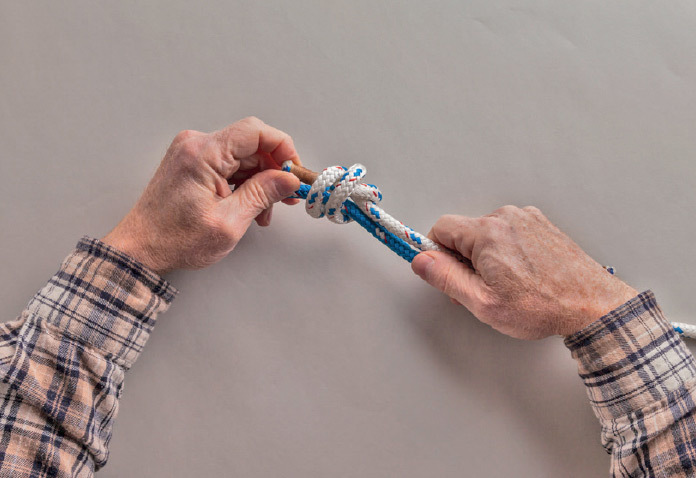 Untying: Grab one pair of crossing turns in each hand and flex the knot back and forth until they loosen. Then pull both working ends through the crossing turns. 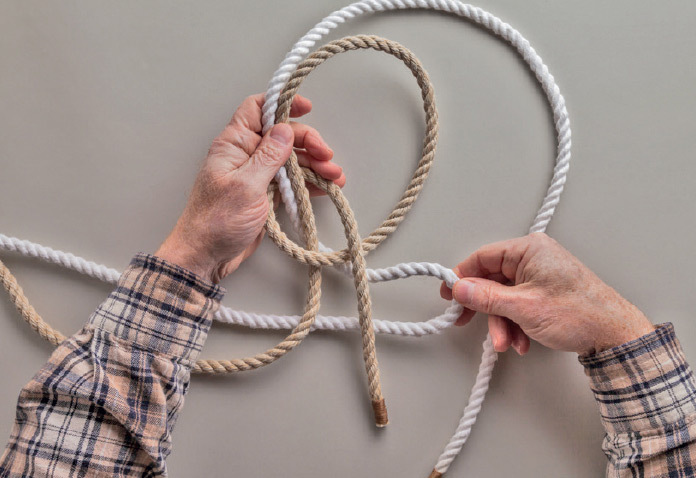 , it’s composed of two , but here each one is tied around the standing part of the other rope, rather than being threaded together. 1. 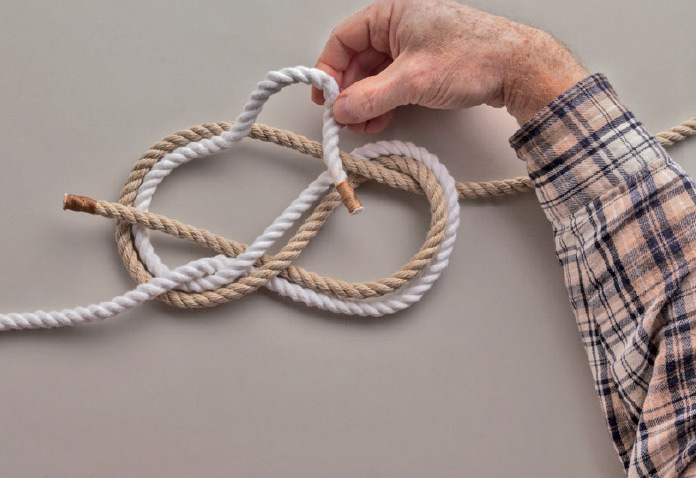 Tie a Figure 8 Knot in one rope. Turn it over if necessary, so the working end emerges from the first crossing turn from back to front. 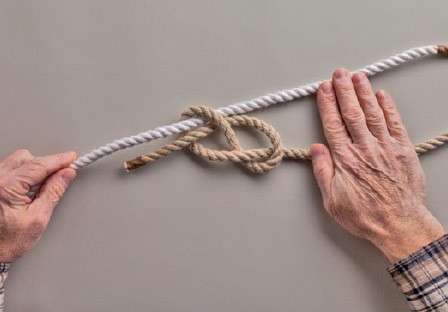 Pass the working end of the other rope through the figure 8’s first crossing turn from front to back, parallel with the first working end but in the opposite direction. 2. 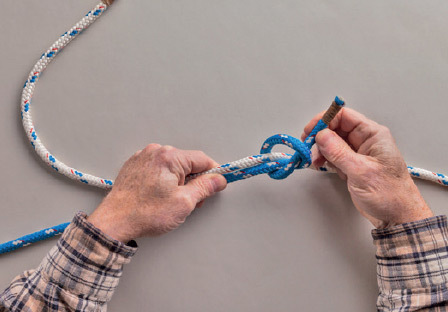 Make an underhand clockwise crossing turn with the second rope’s working end around the first rope’s standing part. 3. 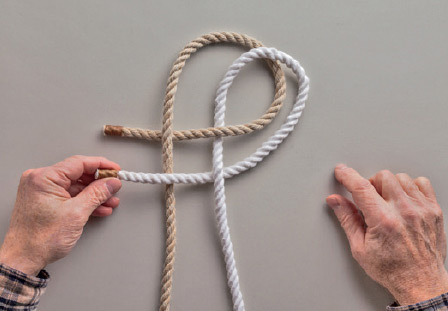 Finish the second figure 8 by taking the working end over the front of its own standing part, then drawing it through its first crossing turn from back to front. 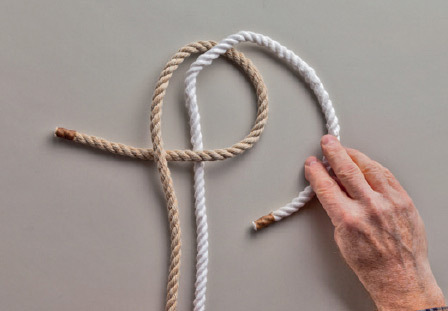 Tighten both figure 8s separately. 4. Pull the two standing parts to draw the figure 8s together. The two may also be left some inches apart as shown, to absorb shock loads. 5. 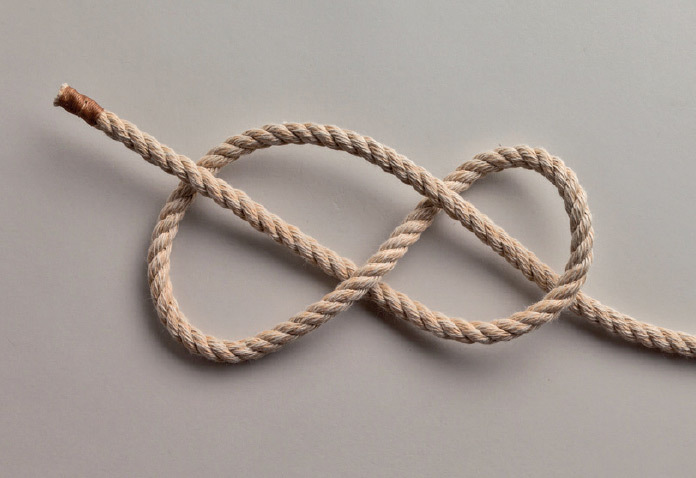 The finished knot with the two figure 8s drawn together. 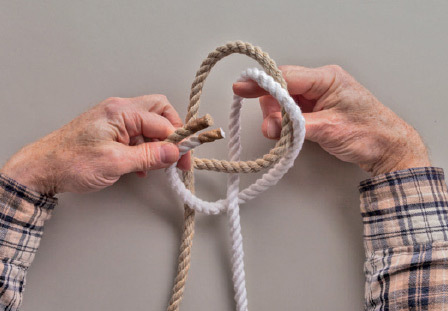 Untying: Pull the two figure 8s away from each other, then untie each separately. 3. 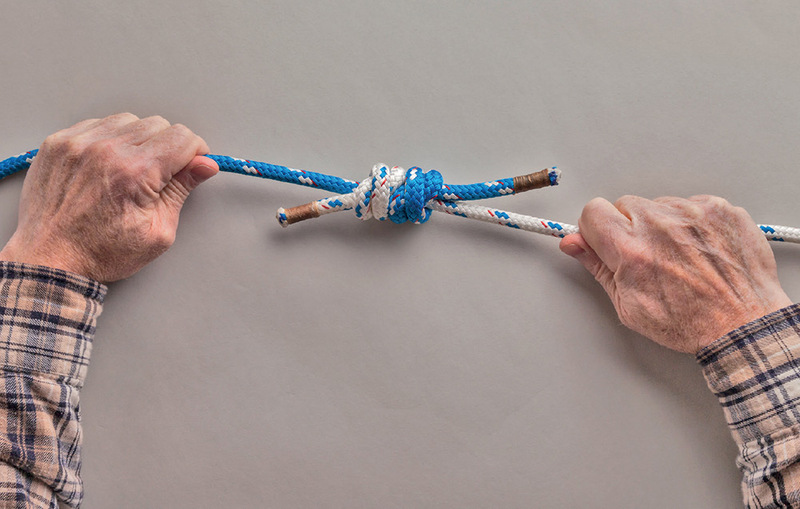 Holding the two ropes together at the Overhand Knot, pull a bight into the standing part of R2 below the knot. 4. Pull the working end of R2 through the bight from back to front. 5. 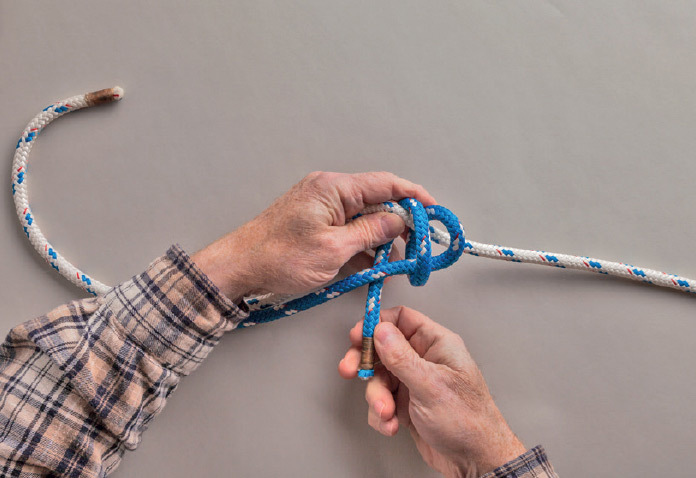 Pull the working end of R2 through the Overhand Knot from front to back. 6. 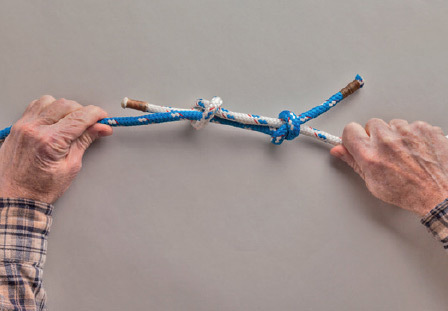 Hold both standing parts together in one hand and pull the two working ends tight with the other. 7. 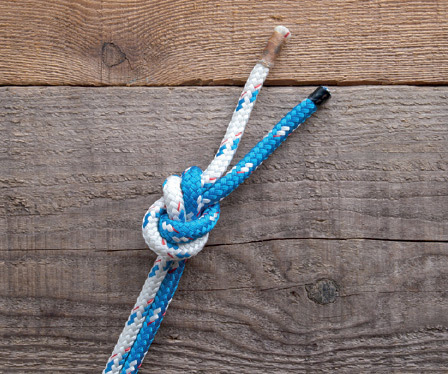 The knot assumes its proper shape after the two standing parts are pulled tight in opposite directions. 8. The opposite side of the finished knot. 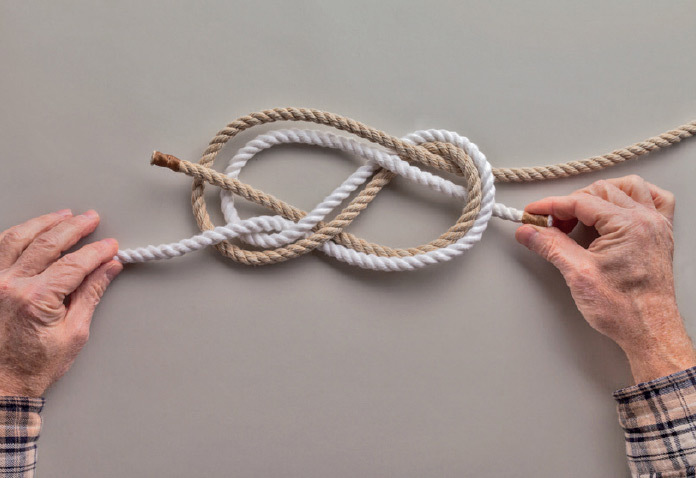 Untying: The knot ends with what are essentially two locking the two working ends against each other. Alternately, they may be viewed as turns around their own standing parts and the first crossing turn of the other rope. 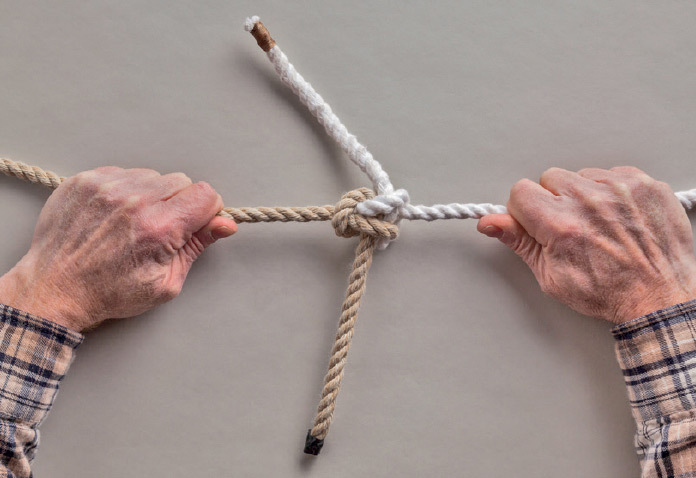 Whatever you wish to call them, pull them in opposite directions to loosen the knot.
. Because the opposing crossing turns must remain parallel before tightening, it is best tied on a flat surface. 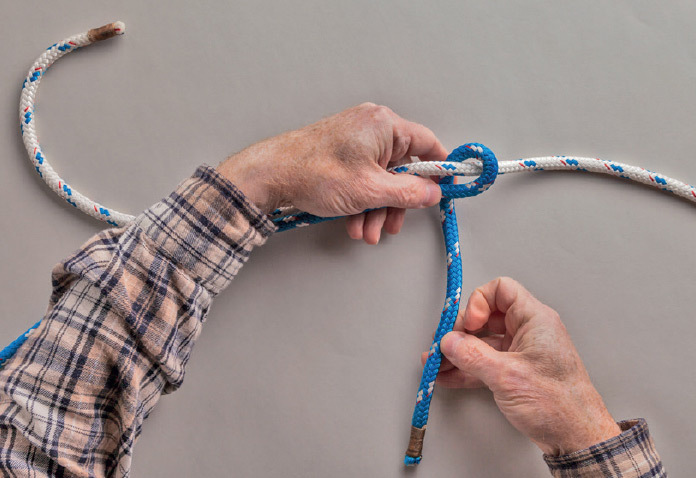 For years it was used by riggers and climbers and not by hunters, but it was popularized by a Dr. Hunter in the 1970s. 1. 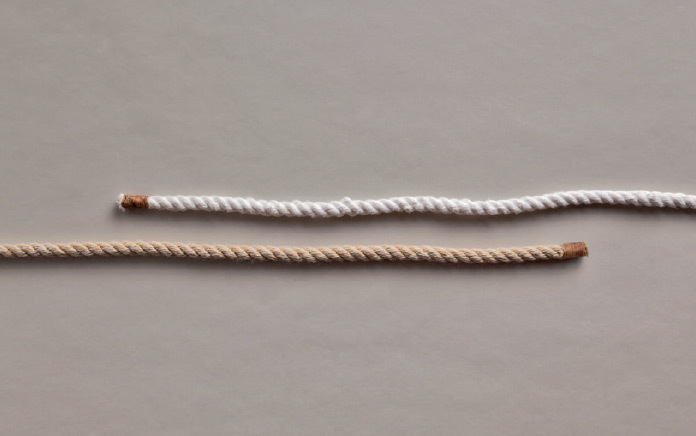 Lay out the two ropes with their working ends facing each other and overlapping by a foot (30 cm) or more, with the rope on the right (R1) above the one on the left (R2). 2. Make an overhand clockwise crossing turn with R1, then a counterclockwise underhand crossing turn with R2 parallel to and around the first one. The working ends will continue to face the same direction as in the original layout. 3. Pass the working end of R1 through both crossing turns from back to front. 4. Pass the working end of R2 through both crossing turns from front to back. 5. The knot before it is tightened. 6. Hold the working ends stationary between thumb and index finger as shown. Grab the standing parts between your other fingers and the heel of your hand, and pull the standing parts to remove all the slack. 7. 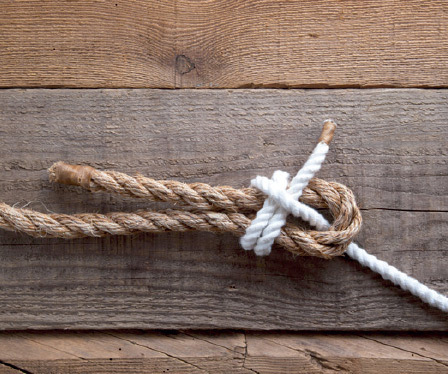 The knot will collapse into its proper shape as the slack is removed. Pull the standing parts to tighten. 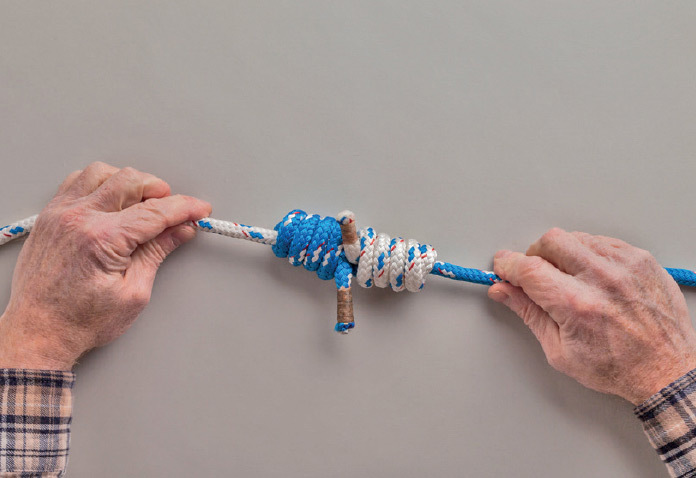 Untying: Each rope’s working end is captured by a bight in its own standing part. 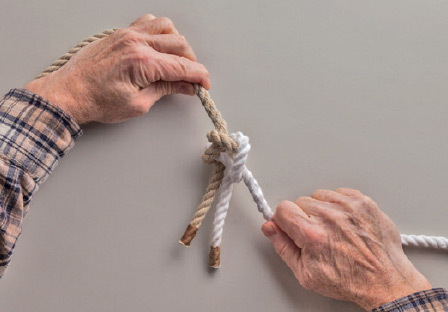 Working with either rope, push the bight toward the standing part; pull slack from the standing part then free the working end of the other rope. 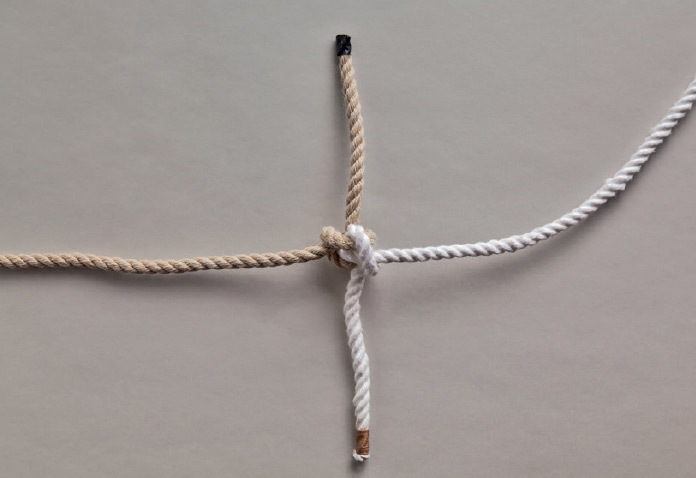 , it consists of two intertwined crossing turns, but in Ashley’s case, the setup places the two ropes in the same direction. 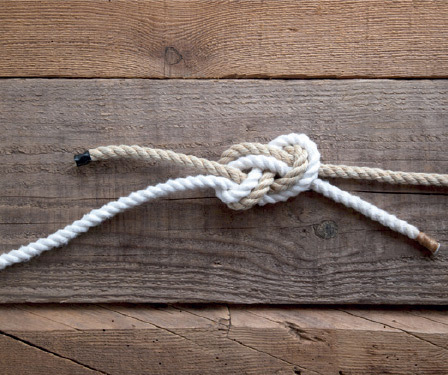 The finished knot is somewhat untidy but effective. 1. 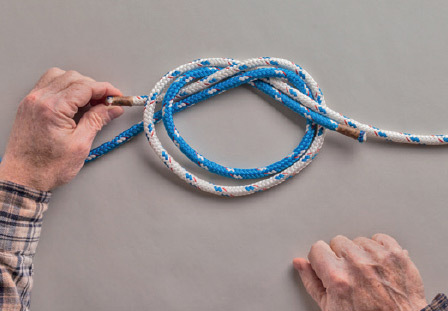 Lay the two ropes side by side facing the same direction. 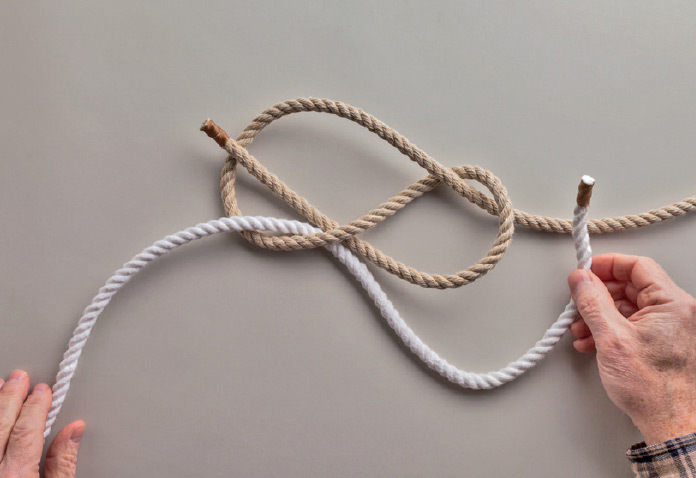 Make a clockwise underhand crossing turn with the left rope (R1) around R2. 2. Make a clockwise underhand crossing turn with R2, placing the working end on top of the standing part of R1. 3. Take both working ends and pass them through both crossing turns from front to back. 4. Pull both working ends against both standing parts to remove slack. 5. Pull the two standing parts to tighten. Fair the knot so that the working ends are parallel and adjacent, with each working end perpendicular and adjacent to its own standing part. 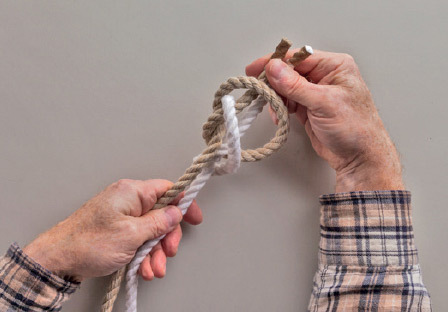 Untying: Both working ends are held under a crossing turn of R2. Lever this down toward the working ends, then pull the ends free. R2 remains held by an in R1 which must then be loosened. , each tied around the standing part of the other rope. The working ends may be taped against the standing parts for added security. 1. 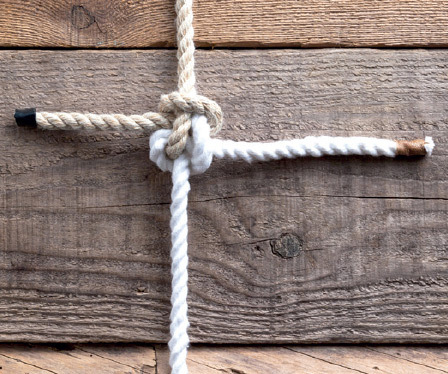 With the ropes facing opposite directions, overlap their working ends by several inches. 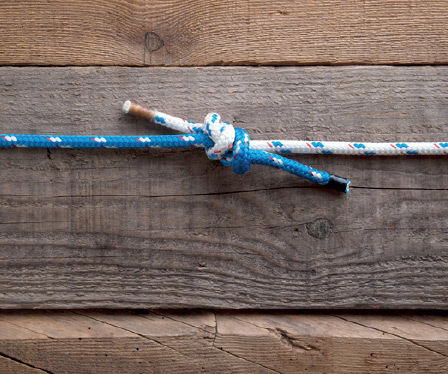 Tie an Overhand Knot in the working end of one rope around the standing part of the other. 2. 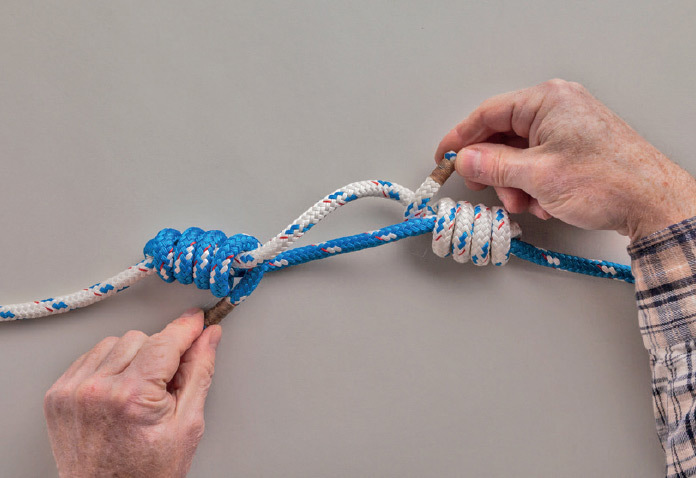 Tie a second Overhand Knot in the second rope around the standing part of the first. 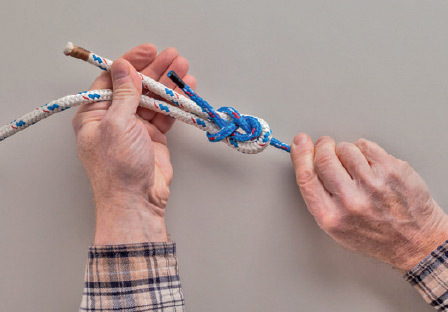 Tighten both Overhand Knots. 3. 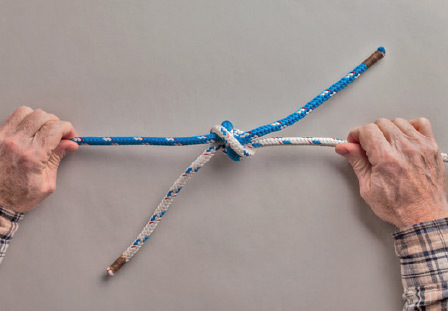 Pull the standing parts to draw the Overhand Knots together. 4. 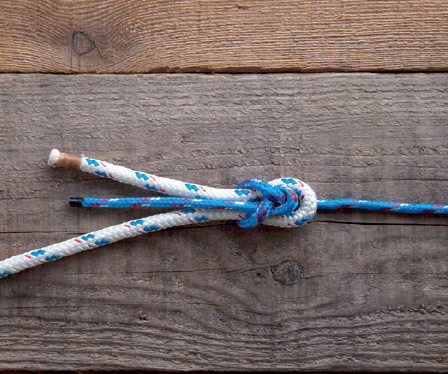 The finished knot drawn tight. 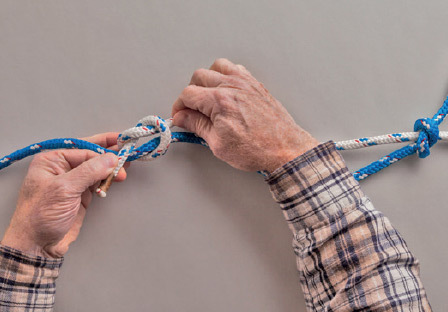 Untying: Slide the two Overhand Knots apart and untie each separately. places around the standing parts of the opposite rope. 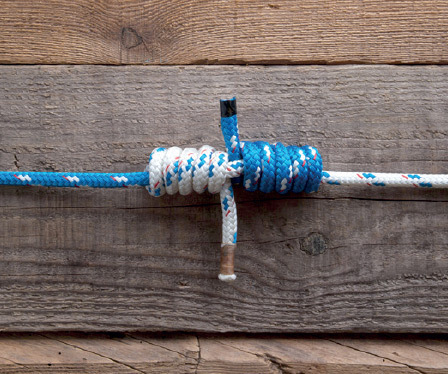 It is much more secure than the standard Fisherman’s Knot and works better in larger rope. 1. 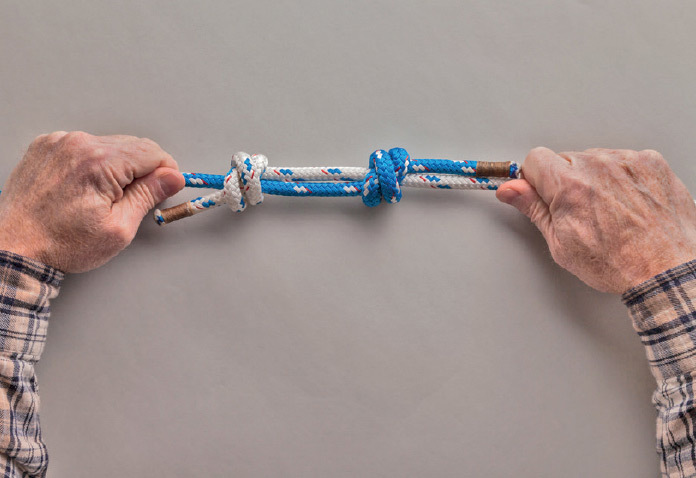 With the ropes facing opposite directions, overlap their working ends by several inches. 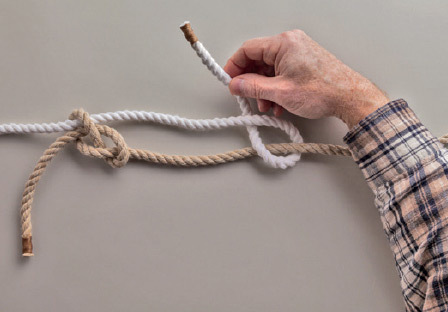 Make a crossing turn with one working end around the standing part of the other rope. 2. Make a round turn around the standing part, working back toward the first rope’s standing part. 3. 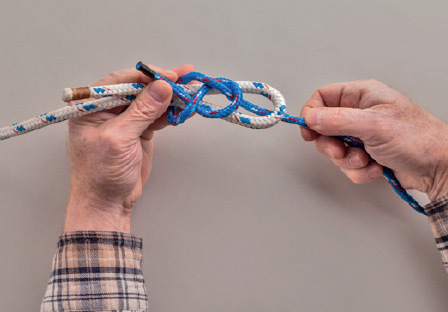 Pass the working end through the round turn and the crossing turn to finish the first Double Overhand Knot. Pull it tight. 4. 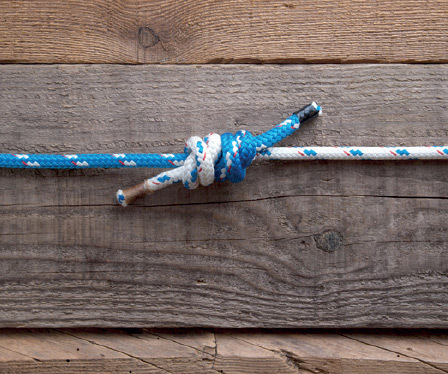 Tie an identical Double Overhand Knot in the other working end around the first rope’s standing part. 5. 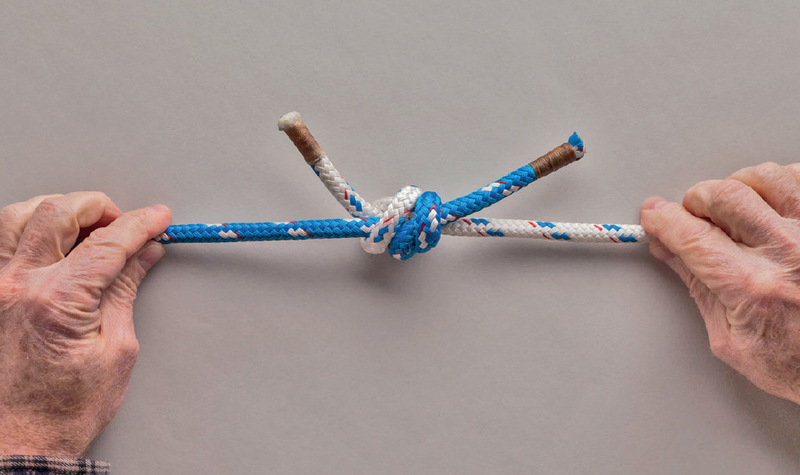 Pull the two standing parts to draw the Double Overhand Knots together. 6. 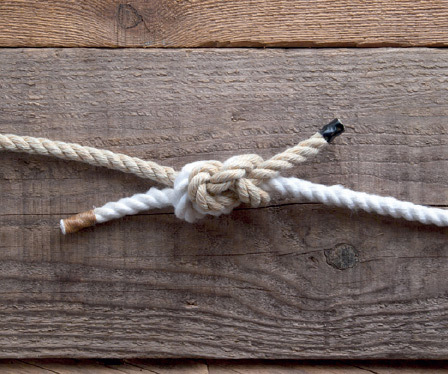 The completed knot. 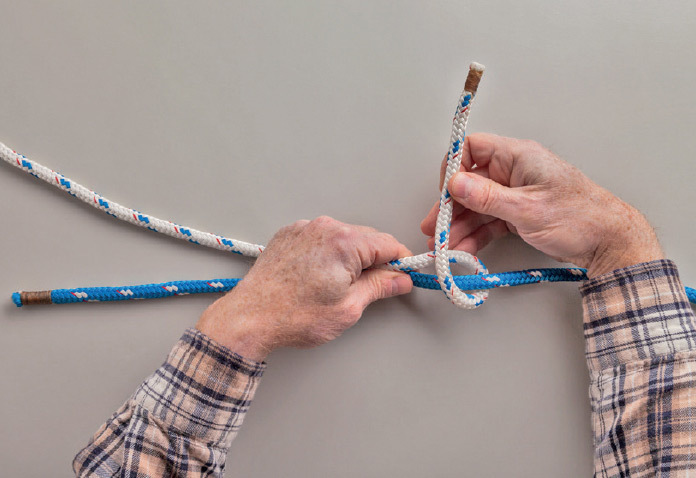 Trim the working ends short for fishing line; leave them long for load-bearing applications such as anchor lines. 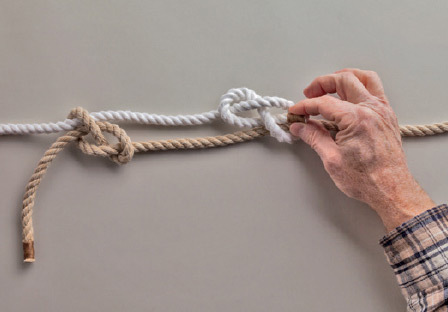 Untying: Slide the two Double Overhand Knots apart and untie each separately. 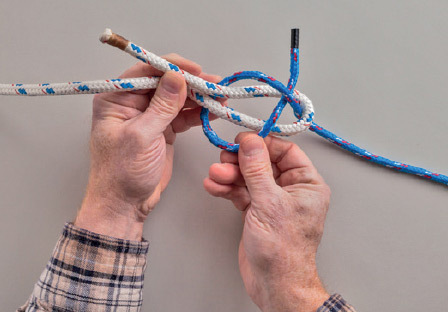 This is a very popular fishing knot, but it works well in heavier stuff too. 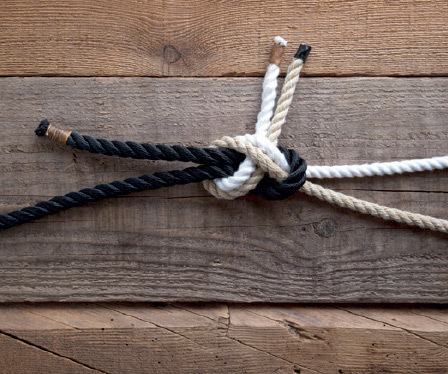 It snugs up so tight that it’s quite difficult, if not impossible, to untie. 1. 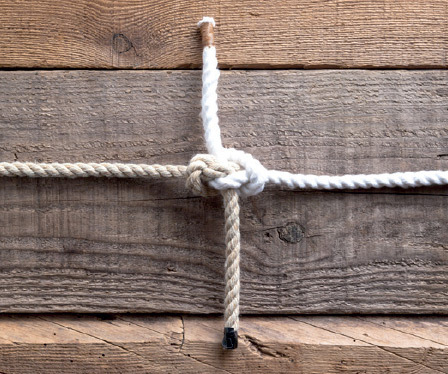 With the ropes facing opposite directions, overlap their working ends. 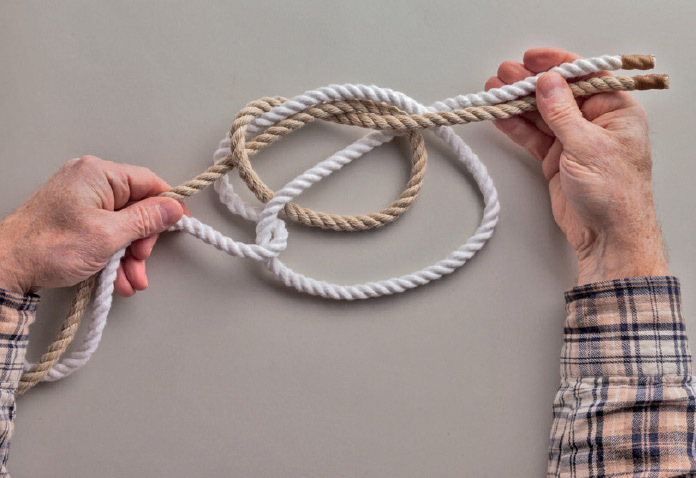 Make a crossing turn in one working end around the standing part of the other rope. 2. Pull the crossing turn tight and make a round turn around the other rope’s standing part, working toward the first rope’s standing part. 3. Keep wrapping round turns around the standing part of the second rope. 4. 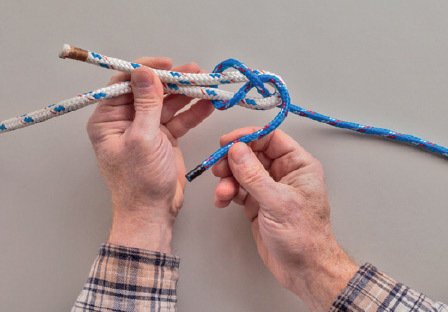 With a minimum of five turns altogether (including the original crossing turn), pass the working end between its own standing part and the working end of the other rope. 5. 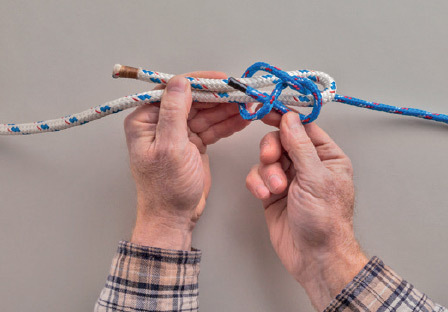 Holding the first working end in place, make an identical set of crossing and round turns with the second working end around the standing part of the first rope. This requires some dexterity or a superabundance of fingers. 6. The two working ends should face the same direction between the standing parts as you pull on the standing parts to draw the coils together. If tying in monofilament, a drop of water or spit on the coils will help them slide more easily and tighten more securely. 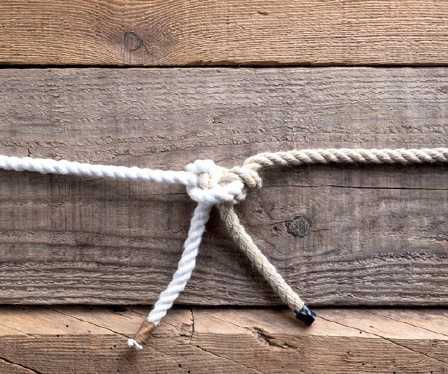 Untying: Consider this knot permanent. 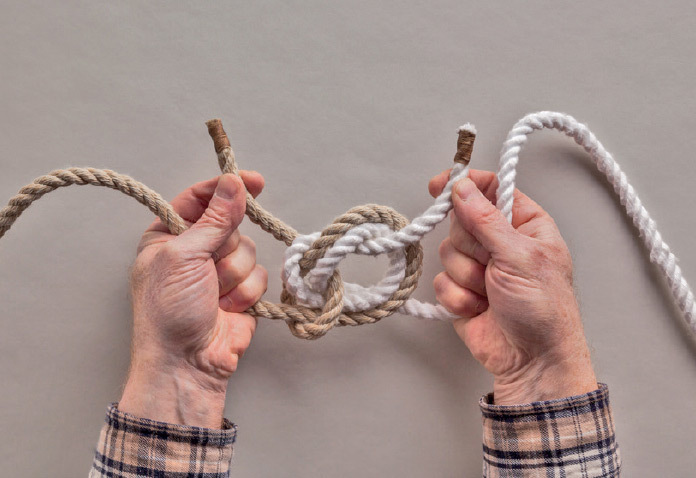 If you must attempt to untie it, try to pull the coils away from each other. That will free the working ends.